Islam’s Jihad against Christians in East Africa: Why Isn’t This on the Nightly News? While I can’t remember Muslims and Christians hugging in the streets of Kampala or the markets of Nairobi during my summer stays in both cities starting in 2005; I do not remember much at all in the way of open confrontation. Granted it was an uneasy truce but even though Muslims and Christians did not embrace one another openly they seemed comfortable enough to live aside of one another in relative harmony until a few years ago. I was comfortable greeting my Muslim neighbors with “As- salaam alaykum” when in the marketplace even memorized the entire Adan after having been woken up each morning while it was still dark outside to hear each muezzin’s unique version of his call to prayer over the loud speaker. I loved it so much I began singing it in Arabic along with the muezzin every morning and felt that the words were a wonderful way to start the day. So I was not prepared for the violence that began to escalate right about the time of the July 2010 FIFA World Cup Finals. Africa has always been a place of diverse religious beliefs from the old religion of the ancestors, Rastafarians, to the more organized faiths such as Sunni and Shia Islam as well as a range of Christian denominations. Toleration seemed the order of the day as everyone went about freely worshipping God in their own way. But then an extremist Islamic terrorist group replaced the dictator, Major General Mohammed Siad Barre in Somalia in 1991 while the American forces invaded Somalia in the Battle of Mogadishu in October,1993. It’s official name is Harakat al- Shabaab al- Mujahideen, The Movement of Striving Youth and yet it is now referred to as al- Shabaab, “the youth.” Actually the organization did begin as a youth group allied to the Islamic Courts Union Government in 2006 that pledged to bring a fundamentalist Islamic state back to Somalia. And this would not be hard for any Islamist group to do. According to a report from Pew Research Center in 2006, 98.6 % of all Somalis are Muslims and most Sunni Muslims. It was not long before al- Shabaab earned notoriety for its ideology attracting experienced war- savvy veterans from countries such as Iraq, Iran, Afghanistan, and Pakistan. It was also no secret that it had begun to receive financial and administrative support from al- Qaeda. At one time al- Shabaab controlled the capital city of Mogadishu as well as the port of Kismayo until African Union forces drove them out in 2011 and 2012 respectively. They pretty much stayed within their own boundaries until their first large scale terrorist attack in Kampala at the Kyadondo Rugby Club in July of 2010. Suicide bombers out on the field that night killed several people and wounded many others as they watched the World’s Cup final game. Later on al-Shabaab took credit for the attack stating that it was in retaliation for the Ugandan forces participation in the African Union currently fighting in Somalia. And then the attacks on churches commenced. 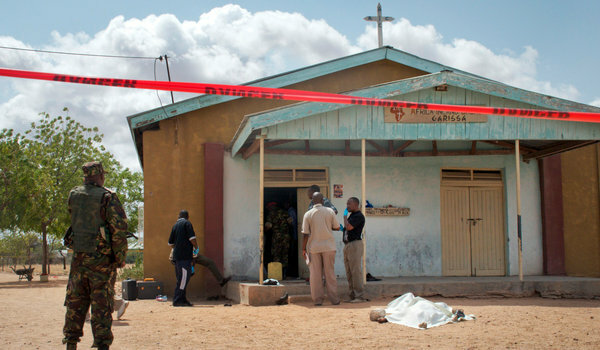 On July 3, 2012 seven masked gunmen first threw grenades then opened fire in two churches in Garissa, Kenya not far from the Somalia border killing seventeen and wounding fifty. By Easter time 2012 Muslim extremists calling themselves, “Muslim Renewal” vowed to attack Christian churches throughout Tanzania causing fear to grow throughout the Christian communities there. On February 17th a Father Musli was gunned down right outside of St Teresa’s Catholic Church in Zanzibar, an island in the Indian Ocean belonging to Tanzania. A Pastor Kachili was murdered in the Geita region of Lake Victoria after he intervened in a dispute between Muslims and Christians over the right to butcher livestock. In the words of Muslim Renewal, “Many more will die. We will burn homes and churches… we are not finished….prepare for disaster.” And in Tanzania, on May 10, 2013 a bomb was thrown into the newly- built St. Joseph’s Catholic Church where the Vatican envoy and the Archbishop of Tanzania were in the midst of celebrating mass during the consecration of the new church. Two people died as a result of the blast and sixty innocent parishioners were injured. Tanzania has a Muslim population of 13, 450,000 that is 29.9% of its total population. According to Lila Gilbert author of Saturday People, Sunday People,” her new book that discusses the reason 850,000 Jews were made to flee Muslim countries in the mid- twentieth century. The title of her book comes from an old Islamic saying, “First the Saturday people then the Sunday people,” meaning, “First we will kill the Jews, then we kill the Christians”. Friends of mine in Kenya believe that Islamic terrorist groups have deliberately targeted churches in an attempt to scare Christians away from attending church. Next Wednesday is Christmas Day, one of the most important Christian holydays of the year; one can only hope that another Muslim attack does not mar the celebrations in East Africa on that day but what an ideal time to send a message off to the entire world? Mombasa, a large resort city off the east coast of Kenya, with an equally large Muslim population and has been the center of violent riots lately in response to the killing of two Muslim clerics Aboud Rogo Mohammed in 2012 and Ibrahim Rogo Omar only two weeks after the Westgate Mall shootings. Both uprisings broke out in Muslim districts of Mombasa and the Salvation Army Church was set on fire this time around. And then the Westgate Mall shootings occurred on September 21, 2012. Terrorists (4 gunmen in all) claiming they were members of al- Shabaab entered the mall equipped with grenades and AK-47 assault rifles and shot anyone in the mall who could not satisfactorily prove to them that they were Muslim asking them to cite verses from the Qur’an or the name of Mohammed’s mother in Arabic in order to stay alive. Those who could not were summarily executed regardless of age. And in true “Millennium” style one of the terrorists used his Twitter account to send short messages out to the world describing their actions. When the armed troops finally made it to the glass doors of the entrance twenty dead bodies blocked their path into the main lobby. What US news reports did not include was that Westgate Mall is located in the Westlands, a wealthy suburb of Nairobi and the site of many of the foreign embassies including the United States Embassy. Was al-Shabaab sending a subtle message to the United States diplomatic mission in Kenya reminding the embassy that it could come much closer to Americans in Kenya if it so desired? And what about the two British tourists who were attacked on December 12th, 2013, seven days ago as they were on their way to a safari in Amboseli National Park? According to all reports a man tried to throw a live grenade into their Toyota Land Cruiser as the car slowed down on one of the major roads out of Mombasa. Fortunately for them, the man threw the grenade at a closed window making it bounce back into the street. But on December 14th, only four days ago passengers riding into Nairobi on a matatu (mini-bus) were not so lucky. Four people were killed and others wounded after a bomb placed inside the matatu suddenly exploded. Today is December 19th, the fifty year anniversary of Kenya’s independence from Great Britain. I have spent the entire day wondering if al-Shabaab will make its anger felt in Kenya today as national celebrations take place. What I do know is that from all accounts al- Shabaab’s ranks grow stronger and that it holds a real grudge against the United States for invading its country in 1993 and repeatedly interfering in its country’s leadership. Remember for centuries, Somali males have earned reputations as fierce warriors and great hunters all over Africa along with very long memories. I am surprised that the American people have not been warned about the continuation of terrorist attacks all over East Africa especially on churches. The Westgate Mall incident was highly publicized; why not these other violent raids? After studying the total picture it seems like every attack al-Shabaab has made has been part of a deliberate course of action and none of these incidents could be considered emotional strikes or the results of spontaneous outbursts. These men may be young and they might be inexperienced but they seem to have gained the attention of other more powerful terrorist organizations like al- Qaeda real fast. I would not be shocked to learn that these same young men are in the midst of acting on plans that lead them to methodically stage terrorist attacks in locations around Europe as well as the United States. Hopefully, the great nations of the world will sit up shortly and pay closer attention to the escalating progression of Islamic terrorist attacks in East Africa so they’ll be ready to foil further attempts long before they begin to experience the consequences of their inaction inside their own borders. 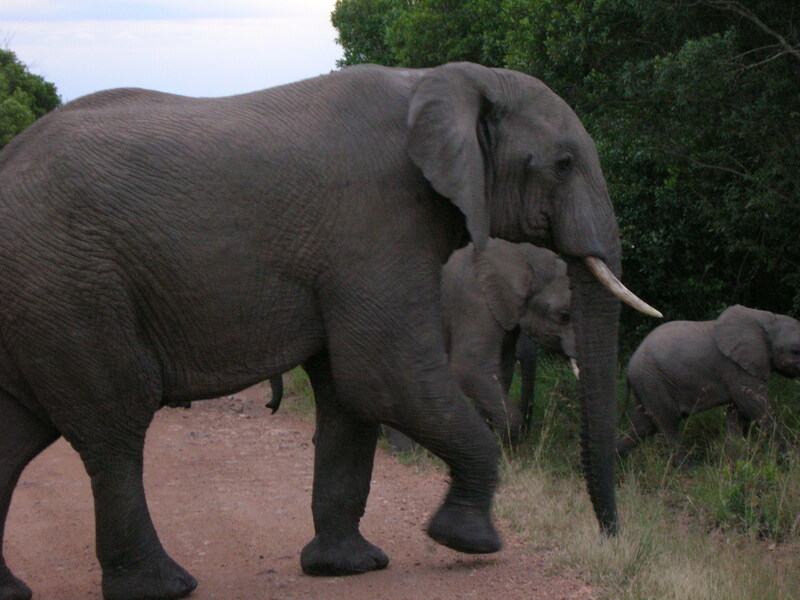 This blog is about the African elephant and its perilous future in Sub-Saharan Africa. I have been on several safaris in Kenya in the past few years where I followed wild herds of African elephants and each journey holds a special place in my heart- beyond memorable. My two best adventures occurred in Tsavo National Park and Amboseli National Park both located in Kenya where I was allowed to take hours of film and photographs of various herds roaming the savannahs there. I have posted two favorite pictures of a bull elephant and the rest of the herd taken on the Maasia Mara. There are two species of elephant: the African elephant and the Asian elephant. The African elephant has also been dived into two sub-species: the savannah and the forest elephant. Savannah elephants live out on the flat, grass-covered plains such as the Maasai Mara in Kenya and the Serengeti ecosystem in Tanzania. Savannah elephants are most numerous and are found in 37 countries south of the Sahara Desert while the forest elephant populates the dense rain forests of West and Central Africa. According to a current study from the University of Illinois at Urbana- Champaign recently published in the Journal of PLos Biology. After studying samples of the elephants’ DNA, Alfred Rocca, lead scientist for the group, maintains that these two sub-species are vastly different from one another- as different as the Asian elephant is to the Wooly Mammoth. No matter its origin, the elephant is the largest land mammal in the world. Female elephants live together with their babies and young children in herds with the oldest and wisest matriarch (female leader) in charge. Male elephants are allowed to live in the herd until they become adolescents (12-15 years) then are made to leave to roam their home ranges alone. The bulls will visit the herd from time to time in order to mate with the females and may stay with the herd for a while but eventually they return to their solitary way of life. I have seen male elephants meet at a water hole in Tsavo in the evening where they shuffle from side to side welcoming one another with their trucks raised as they emit a series of low rumbling sounds. They detect these vibrations through their feet, skin, and trunks but as soon as they’re done drinking off they go- all by themselves again. I have also seen groups of three to four bulls roaming the preserve together during the day but eventually they separate and each one goes his own way. The bull elephant’s ability to exist alone in some of the most perilous places on Earth gives you some idea just how powerful an adult male elephant must be. No other animal- even lions can take down a bull elephant in the prime of his life and rarely try unless they are desperately hungry. Even then, it would be the lions that would fare the worst in the ensuing battle. A bull elephant can accurately be described as the king of his domain. Elephant herds move around using regular migration patterns that were established many years ago usually built around access to water holes and availability of food. These routes have been traveled the same way for hundreds of years. It is the matriarch who recalls this route best and leads her family through the yearly migration path. Elephants may remain at one site for a time but eventually move on traveling through their home range year after year in a very predictable course. Home ranges can vary; they may be as small as 24 square miles or as large as 6,000 square miles. Elephants do not recognize country boundaries so many herds cross national borders in their attempt to complete these migration treks. Their long treks between countries has made it very difficult for scientists to get an accurate read on the total number of savannah elephants and identifying the entire population of forest elephants has been a much more difficult venture . Herds of forest elephants are well hidden by the dense underbrush of the tropical rainforests and covered by a dense canopy of trees. There are three things that are responsible for the African elephant’s move towards complete extinction: 1.) an ever increasing human population, 2.) the harmful effects of climate change, and 3.) criminal poaching ventures. Amazingly, a recent Population Reference Bureau Report released in September, 2013 predicted that Sub-Saharan Africa will record the world’s largest population growth from 1.1 billion to 2.4 billion people between 2013 and 2050. By the year 2050 the current population in Africa will have more than doubled by 1.3 billion people making Sub-Saharan Africa the largest growing region in the world. If these predictions are correct Sub-Saharan Africa will overtake the continent of Asia with the highest rate of population growth. In the past, Sub-Saharan Africa’s numbers had not increased significantly due to the high number of HIV/AIDS deaths as well as high infant mortality rates. But improvements in access to health care and medicine around the area has been credited with creating a larger population that is living longer than ever before. According to the report, women in sub-Saharan Africa still average 5.2 children during their lifetime, compared to 1.6 in Europe and 1.9 in North America. As the human population increases throughout Sub-Saharan Africa, people will need more land upon which to build their houses and establish their gardens and fields. That means that the elephants will get less and less of the same area to roam. The home range of the African elephant has been reduced by 20% over the last decade due to human expansion. In Rwanda, a country equivalent in size to the state of Maryland, the elephant population of 100 animals is expected to decrease over the next 20 years, while the human population of 7.5 million is estimated to more than double during the same time period. And if the predictions concerning Sub-Saharan Africa prove true, a record number of human beings will continue to take land away from the wild elephant herds and in the not so distant future wild elephants will lose all access to their traditional migration paths. Even now this dilemma has pitted farmer against elephant in an all-out war as the herds continue to follow their annual migration routines despite changes in the land. Elephants have been credited with stampeding over houses and eating entire harvests leaving the subsistence farmers in their wake homeless and hungry as a result. In response, farmers have turned on the elephant by poisoning local water holes and maiming elephant herds that come too close to their villages and fields. Elephants have nasty tempers and continue to kill human beings every year. In 2010 an American woman living in Kenya was trampled to death along with her baby while on a hiking tour just outside of Nairobi. In 2010 the United Nations Food and Agriculture Organization (FAO) released a wildlife toolkit to help African farmer’s protect their crops from wildlife looking to eat or destroy their crops. They were encouraged to do things like shoot the elephants with Ping-Pong balls, make and throw dung bricks, as well as create beehive fences to keep marauding elephants from destroying their property. Seems elephants are afraid of bees and even the sight of their hives is enough to keep them at bay. According to the FAO the annual cost of elephant raids to crops ranges from $60 dollars US to a farmer in Uganda to $510 dollars US to one living in Cameroon. At best this is a feeble attempt by the UN to stem a monumental problem. Eventually there will just be too many people occupying the land and no room for the herds of wild elephants to roam. And no amount of Ping-Pong balls will solve the real problem! Penning wild elephants together is not the solution either. Results of wildlife studies have concluded that wild African elephants do not adjust well to changes in their migration routines. Females are directly influenced by habitat conditions and population densities so birth rates can severely decrease in high density or nutritionally stressed herds. Wild herds were not meant to live in close proximity to one another and can become anxious and unsettled even hostile when forced to live too close to other groups. In a study commissioned by the World Bank, researchers concluded that from a global perspective the world is headed for “average temperatures 4 degrees (Celsius) warmer than pre-industrial times by the end of this very century.” Food security will be the overarching challenge for Sub-Saharan Africa, with additional dangers from droughts, flooding, and drastic shifts in rainfall. The report also stipulated that climate change will not affect all countries of the world equally. Some of these destructive effects will be experienced by the nations of Sub-Saharan Africa which in turn will affect their food supplies, individual economies, and coastal regions, while limiting arable land and fresh water. These nations will be less able to adjust to these hardships producing an increasingly unstable environment, which in turn could promote wars between struggling countries and peoples. The 1.5°C-2°C warming in Sub-Saharan Africa is expected to bring about increased droughts and higher aridity causing farmers to lose between 40 to 80% of the fields where maize, millet, and sorghum were traditionally grown. This is expected to take place during the 2030s and 2040s. By 2080 annual precipitation should decrease by about 30% in southern Africa, while East Africa will see more rainfall. Entire ecosystems will change and many types of grasslands will turn into woodland savannas instead decreasing access to pastoral ranges needed by livestock and savannah elephants. What will become of the wild African elephant when their home ranges flood in the east but dry up in the south and their current ecosystems drastically change? As with many crises in Central and East Africa one is never too sure just who the good guys are and nowhere does this seem more apparent than when applied to the current poaching situation that has escalated to outrageous proportions in Sub-Saharan Africa. I would like to tell you that the poaching situation as it currently exists is all the work of terrorists and criminals- and to some extent this is true; but when the entire history of the regulation of ivory is examined it makes for a far more complicated and confusing story than that. First of all the African elephant has come close to extinction before and the ivory trade has steadily grown since the 1940s. In the 1960s, raw ivory cost between $3 and $10 per pound but by 1975, the price had risen to $50 and by 1987, it was $125 per pound. By this decade there was also a newer manufacturing procedure in place in the Orient that allowed for the mass production of ivory carvings for the first time. This, in turn, led to a rising demand in Asia and an increase in poaching in Sub-Saharan Africa. 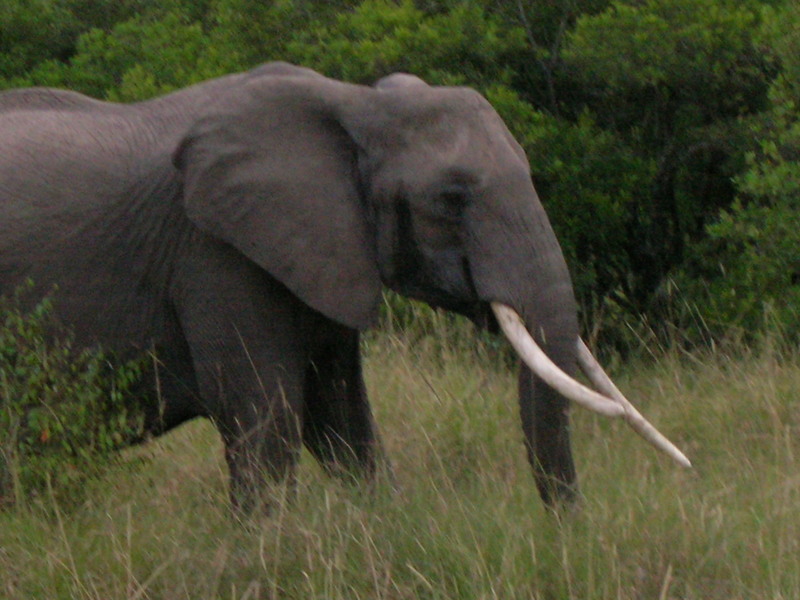 From 1979 to 1987, Hong Kong, Japan, and Taiwan, (in that order,) were the primary buyers of raw ivory. The herd population increased during the first few decades of the twentieth century; especially during World War I and II when the world powers were too busy killing one other to hunt elephants. But then the wars ended and after a few more peaceful decades during which these same African countries were engaged in fighting for their own independence from European control the herds began to be overhunted again mostly by rich, white hunters in search of safari trophies. While African elephants have been hunted for several centuries, the mass killing of elephant herds as a business started in the 1970s. By the end of the 1970’s it was obvious that something had to be done so the first world ban on elephant ivory was put in place and it seemed a fairly successful ruling until a resurgence in poaching occurred in the 1980’s. By all estimates, the elephant population in Sub-Saharan Africa decreased from about 1.2 million to 600,000 animals in the 1980’s. Kenya alone lost almost all of its wild elephant herds to poachers during this decade. By 1986, approximately 75% of all raw ivory for sale on the international market had originated from illegal sources –amounting to the tusks of 89,000 elephants. Furthermore, sanctions imposed on smugglers were not nearly severe enough to stop the poaching from occurring. For example, a truck owner was fined only the equivalent of $3,000 for transporting 2 tons of illegal ivory to an East African port. Threatened with extinction again in the 1980’s, elephant ivory was banned from international trade by the 1989 Convention on International Trade in Endangered Species of Wild Fauna and Flora (CITES) but there were also two sanctioned sales of ivory stocks to China and Japan in 1999 and again in 2007. And sadly in November 2002, delegates from both the United Nations and the United States attending the Convention on International Trade in Endangered Species of Wild Fauna and Flora (CITES) in Chile agreed to ease the 13 year old global ban on ivory by allowing one-time exemptions to Botswana, Namibia, and South Africa to sell off tens of millions of dollars’ worth of ivory culled from elephants who had died of natural causes in their national parks although the countries of Zambia and Zimbabwe were denied their request to do the same. The UN delegation heartily endorsed this agreement while the country of Kenya begged them to reconsider their position. Many delegates were horrified by the lift on the ban warning that the glut of ivory on the far-eastern market would rekindle international poaching endeavors once again. Teresa Telecky, a delegate representing the US Humane Society at that time aptly predicted that the ‘legal sales of ivory would revive the previously dormant black market for ivory.” And she was right. At the 2013 Convention on International Trade in Endangered Species of Wild Fauna and Flora (CITES) in Bangkok, Thailand, Joyce Poole co-director of Elephant Voices stated that Sub-Saharan Africa had sustained “its worst year yet. More than 7% of all its wild elephants were killed in 2013 alone- and that translates to 40, 000 elephants. And now anyone with a decent rifle can join in the hunt. Terrorist groups like al- Shaaab working in Kenya out of Somalia, The Lord’s Resistance Army in Central Africa, the Boko Haram in Nigeria, as well as the Janjaweed of the Darfur region in Western Sudan have all taken to poaching ivory and opened new trade routes in order to finance their operations. And if that were not bad enough, the military in certain African countries has turned to poaching in order to subsidize personal endeavors as well. When the tusk of one African elephant can earn an African poacher a year’s salary desperate men resort to killing elephants in order to feed their families. So what will it take to save the elephant? Whether the African elephant herds can survive in spite of smaller home ranges, climate change, and poachers remains to be seen but this will only happen if the world comes together in an organized way to create a viable plan to save them. It is true that terrorists now threaten the herds but even if they disappeared tomorrow the wild African elephant would still be well on its way to extinction. There must be an international plan in place before things like human encroachment and climate change even begin to jeopardize the elephants’ existence. If not, how will we ever explain to our children that we stood by and watched as the mighty African elephant disappeared from the face of the Earth? It’s good to be back.